When the National League’s Louisville Colonels folded following the 1899 season, Major League Baseball ceased to be played in the charming Kentucky city on the banks of the Ohio River. However, there is a lasting bond between the city and MLB largely due to the work of a single family. 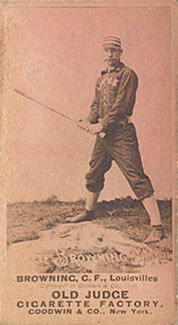 N172 Old Judge card featuring Pete Browning from the late 1880s, presumably with an original ‘Louisville Slugger’ bat. As the legend goes, one day in 1884 a 17-year-old John Andrew Hillerich – known as ‘Bud’ – witnessed Louisville’s greatest star – Pete Browning – break his favorite bat. As fortune would have it, Bud was the son of German immigrant J. Frederick Hillerich, who had established a woodworking business. An enterprising young Bud crafted a bat made from white ash for Browning. Had Browning – known as ‘The Gladiator’ – gone hitless the history of baseball would likely have been very different, but Browning instead got three hits and the ‘Louisville Slugger’ was born. Over the next 130 years it would go on to become one of the most iconic brand in America, and synonymous with the game of baseball. Today, John A. Hillerich IV – Bud’s great-grandson – serves as CEO and President of the company that has been known as Hillerich & Bradsby since 1916 – when salesman Frank Bradsby became a full partner and brought with him his depth of knowledge on sales and marketing. The Louisville Slugger Museum & Factory in downtown Louisville features the world’s largest baseball bat. In 1996 the company moved into a new location at 800 West Main Street in downtown Louisville, in the city’s famed Museum Row on Main district. In addition to manufacturing the bats, the company established a premier museum featuring exhibits, and relics from the company’s past. There is no doubt as to which building contains the museum, as immediately outside is the world’s largest baseball bat. Ten years ago David Hunt, CEO of Hunt Auctions, ran a live auction at the museum that Anne Jewell, Executive Director of the Louisville Slugger Museum & Factory joked the night before this year’s auction she thought might be the last. The results of that first auction were phenomenal and brought about a ten year relationship between the two companies that has benefited both. The attendance figures back up these statements. At the time of the first auction yearly attendance at the museum was a respectable 190,000. Now, ten years later, attendance has boomed to an impressive 270,000 annually. In addition, the museum helps bring a vibrancy to downtown Louisville in a time when many urban areas throughout the country are hurting. During the baseball season – the museum’s busiest time – they employee 75 people, and during the off-season they still keep on about 30 employees. One such employee is Nathan Stalvey – museum curator. Stalvey has been with the museum three years after seven years with a folk art museum at his alma mater – the University of South Carolina. He recounted how the original job listing was very similar to most museum posts and required experience designing exhibits and working with donors. However, what stood out for Stalvey was the requirement that the applicant must be a baseball fan and he informed me that during his interview he wore a Dodgers jersey – and got the job. Stalvey went onto explain that the museum only began going out into the secondary market in 1996, and prior to that everything in the collection were materials set back by players for use in future production. One such example – which Stalvey described as the museum’s ‘holy grail’ – is a bat Babe Ruth used in 1927. “Ruth hit 21 home runs with the bat before it cracked and notched each one like a gunslinger,” Stalvey added. When Ruth returned the bat to the museum he did so with the request that all future bats shipped to him be done so with the same specifications. For more information on the Louisville Slugger Factory & Museum including information on how to plan your visit or take a virtual tour, visit: SluggerMuseum.com.